Julius Caesar, before he became leader, made two expeditions to the island of Britain in 55 BC and 54 BC, the first of which was a failure, and the second was to begin to coerce the local tribal kings to pay tribute to Rome. There followed a period of diplomatic understanding between the Empire and the Island and trade was established with the Romans through the turn of the Millennium. In 43AD Aulus Plautius took several legions and invaded the south coast, winning several battles with the aid of elephants and, pushing up past the Thames to finally take the capital Camulodunum (modern-day Colchester, and site of the only known Roman Circus in Britain). The revolt in 60-61AD led by the famous Boudica destroyed the Roman colony at the capital, caused the Romans a severe setback, and very nearly convinced Nero that Britain was more trouble that it was worth. In the year following the administrative turmoil of 69AD the Romans reasserted their hold on the Island, conquering all the way up to the north of Scotland, however around 105AD the Scottish tribes proved too much for the Romans, forcing them south and leaving a wake of burnt forts. At the beginning of Hadrian's reign a new uprising in Scotland was the last straw for the visiting Emperor and when he toured Britannia in 122AD, he instructed the building of a mightly barrier to draw a line under the acceptable limits of Roman expansion. It was the first ever Roman statement of the end to the expansion of the Empire. The result was what we now call "Hadrian's Wall": A 73.5 mile (80 Roman mile) long military fortification which stretches from coast to coast across England. It's primary purpose was built to prevent military incursions from the north, but also would allow limited regulated trade with friendly tribes. It was a physical mark for the most northerly extremes of Roman territory and exploited naturally high ridges across the breadth of the country to maintain a strategic advantage against any attackers. The wall took about eight years to build, starting in the east in modern-day Newcastle (later extended to a part of the city called Wallsend), and terminating on the west coast, on the shores of the Solway Firth. Eighty Milecastle forts, each a Roman mile apart would run the length of the barrier with several dozen troops in each. The wall was designed to run at an ambitious 10 feet wide and about 20 feet high but varied depending on the available materials in the area, with some sections being built largely from turf, and the planned thickness of the wall diminishing early in contruction. As development progressed it was decided that in addition to the Milecastles and turrets, more than a dozen large forts holding up to 1,000 troops would be added, giving a total occupation on the wall of roughly 9,000 throughout. After Hadrian died, a new ambitious line of fortification was set up further north: the Antonine Wall named after the Emperor who planned it. However he was unable to conquer the tribes beyond, and the Hadrian's Wall was once again the main line of defence in 164AD. The wall suffered serious assaults from the Picts in 180 and 196 and sections had to be reconstructed but beyond that into the third century AD the wall was peaceful and the occuping troops steadily integrated into the local families. As the third century wore on, Rome relaxed its grip on Britain as various invaders such as the Saxons combined with decline across the Empire to make the prospect of maintaining this extreme outpost less attractive. 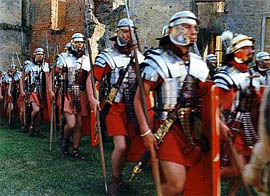 By 410AD the Romans had withdrawn their military and the country was left to fend for itself. With the inter-marrying of local tribes and Romans, there were enough military families remaining who called Britain their home to allow the wall to be garrisoned for a period well into the fifth century. Banna was one of the 16 forts along Hadrian's Wall and is positioned at the western end. Today there is a visitors' centre on the former farm site which is called Birdoswald. It is unique in being the only place on the length of the wall where occupation can be demonstrated during the Sub-Roman era. One portion of the site has been excavated, showing the granaries whilst the rest of the site has been excavated and re-filled, or is awaiting excavation. The picture above left was taken at Birdoswald (Banna) in October 2007 and shows the north west corner of the fort. The image above right is a computer-generated model of the fort in position, with the repositioned wall on the left of the picture, running off to the west. The wall itself was originally built from turf and the fort was a later addition and positioned so that the wall ran through its east and west gatehouses. It was manned from AD 112 AD to 400 and habitation continued until about 500AD. The internal buildings consisted of central headquarters, granaries, barracks and exercise area. The granaries which are exposed today were later replaced by timber halls which are now represented by large wooden posts. In the image on the right, the camera is looking south, down the length of the west wall and in the centre of the picture is the west gatehouse. Walking through the gatehouse these granaries are on the right. There were also settlements either side of the fort showing how these military structures became centres of the community. The original turf wall which ajoined the east-west gatehouses was replaced by a stone wall, but it was moved to align with the north wall of the fort. No other site is known to demonstrate this kind of repositioning allowing comparison of the two types of wall. To the east of the fort lies Milecastle 49 which contains the remains of pre-Roman buildings, and beyond it is the remnants of a bridge which allowed the wall to cross the River Irthing without interuption. Click here to read about the Time Team dig of Banna. Modern technology allows us now to do some amazing "armchair archaeology" as this picture on the left demonstrates. It is an image taken from the superb Google Earth which you can download for free here. The route of Hadrian's Wall is clear on the satellite photographs and if you follow its route across the country you will also see that the images show up various in different states of exposure. The image above left is a prime example as it clearly shows the line of the original turf will as a dark shadow running towards the East Gate. On the West side of the fort it is not immediately clear but a little further away from the fort the dark line of the turf wall becomes extremely clear and can be followed west along its old course until it converges with the modern stone wall. Google Earth affords many opportunities to explore the course of Hadrian's Wall quickly and scout around various places which are hard to access from a public highway. It is by no means a substitute for getting up there and walking around the Roman sites, but it is a fascinating adventure in itself. It also allows a visitor to one of the forts to put it in context if they don't intend to walk any the wall's length. Sites like Vercovicium (modern day Housesteads) pictured above right are as much a revelation from the air as they are impressive on the ground. When exploring from the air the hidden chunks of history become visible. These may be difficult to derive excitement from at ground level, and are sometimes not even visible on-site, but on the aerial photography are burried structures still to yield their secrets. The image above left shows a selection of building outlines not far west of Housestead, partly aligned to a north-running road which would have lead towards the wall in Roman times and still forms part of the path of the modern-day road. Following Hadrian's Wall east on Google Earth will take you right into the centre of Newcastle and if you look carefully you will see sections of the wall only a feet long which crop up alongside A186, West Road, reaching the place where construction began. The images at the top of this page which show a complete and impressive Hadrian's Wall are taken from the film King Arthur. The film, whilst entertaining fiction, is nevertheless a muddled mess of historical facts, inaccurate dates, and incorrect events. The basis of the film is that King Arthur of legend was in fact a Roman soldier from the far flung Sarmatia who was drafted thousands of miles across Europe to the border of Scotland. Whilst it is true that the Romans enlisted the help of various tribes, there is no logic to the movement of this collection of Sarmatian men from one end of the Empire to the other. The film suggests that the Pope weilds power but this incorrect because although the Roman Empire was undoubtedly Christian by this period, all directives were purely Imperial. The film also makes out that Britain is still a country of occupied natives under Roman rule but the film is set in 467 AD, so there have been four hundred years - thats twenty generations - since the first Romans arrived, and the Christian population of Britain would have considered themselves Romans. When we talk about a Roman "withdrawal" from Britain, it is purely from a military point of view, not a cultural one, and sub-Roman Britain existed as a Romanised culture for nearly a century until further invasions. With this in mind, it is also incorrect to suggest that the Christian Romans (such as in the family Arthur is sent to rescue) would be spending their time torturing and sacrificing the local pagans, because most of Roman occupied Britain was Christian, not pagan. Putting the historical issues to one side, the film is worth a look, if only for the magnificent (if possibly rather overblown) recreation of Hadrian's wall, which was 1km long set built in Ireland.